Please continue to use clickable-thumbnails linking to the larger image -- to help those with slower connections. Many image-hosting sites will automatically generate 'clickable-thumbnails' for you, as well. An example of the BBC code needed is below. The forum now has an option to resize images to 320x240 pixels using "rimg" tags. You can insert a pair of such tags with the "rimg" button, which sits rightmost on the row of buttons above the text field where you type your message. Upload your image to an image hosting site then paste the URL of the "Direct" or "Download Image" link between the rimg tags. This posts on the forum a 320x240 pixel clickable image which links to your original-sized image. Thank you - for your continued support of LinuxMint. Click on thumb then under Action dropdown menu choose All Sizes to see closeup. Liking KDE tho hated it back in 2006-2008. I remember that wallpaper well. I like it alot! 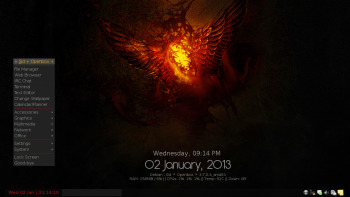 It has been a rather long time since I have posted a screen shot of my Desktop. I rather like the wallpaper as it has that "Minty Green" look. I'm running Mint 14, and all the magic is in the Taskbar. Adler's Home @ http://www.jjmacey.net/, And Where I Have Been. 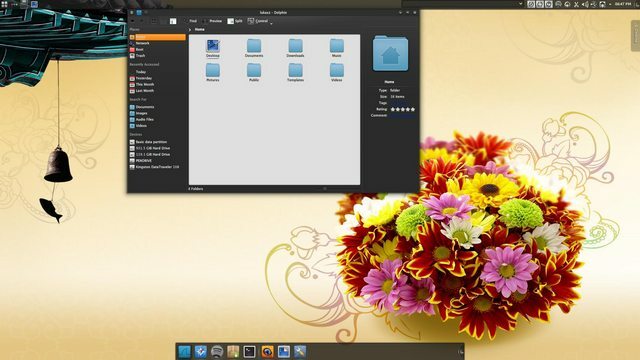 Mint 14 Cinnamon with Blackbird GTK theme. 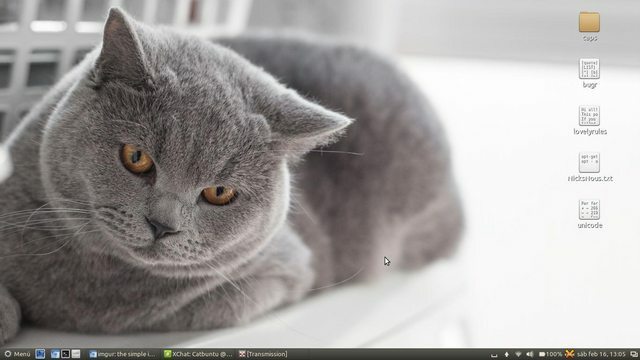 Linux Mint 14 64-bit Cinnamon on my 24" iMac. Runs great! Please read the sign on the door. It says "Linuxmint Desktop"
Yeah . Although historically there are quite a number of non-mint screenshots, you're very right. But, ... everyone is welcome here. I want to include everyone and all Open Source / Linux/BSD/Unix-based OS and Distros. I'll change this and all future Topic Threads to "All Desktop Screenshots" only. Where's the Clock Widget from? The centre rings represent the time. 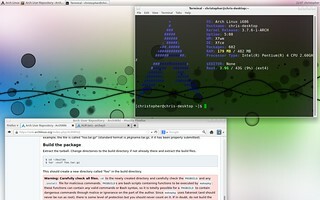 Top Left Outer Arch (White): Filesystem usage. Top Right Outer Arch (White): Home directory usage. Bottom Right: 4 CPU cores (Light Blue) and total CPU usage (Dark Blue). Left Thick Outer (White): Swap usage. Left Thick Inner (White): RAM usage. Thanks for that link! I'll give it a shot. vrkalak wrote: But, ... everyone is welcome here. But of course. I'd have thought the green grin would've indicated that. Wallpaper: A lovely photo of my cat.